Editors note: This is the first in a 3 part series. 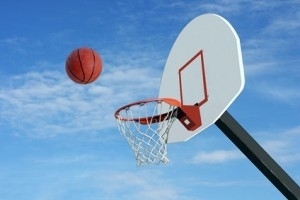 Basketball is an intense game of speed, agility, quickness, power, endurance, skill, and mental focus. By following proper sound nutrition before, during, and after a basketball game, a player can maximize their training and competition level. One of the biggest challenges basketball players face is fatigue. Combating fatigue helps with mental focus and plays a large part in injury prevention. It also gives a player a huge competitive edge over their opponent. Sleep is probably the most overlooked aspect of proper preparation before and after a basketball competition. To perform at your highest level, a player should obtain 8-9 hours of rest prior to a game and/or practice. Lack of sleep directly effects fatigue levels, and can negatively alter a players overall performance. Cramming to finish an assignment or study for a big test the night before a game is stressful and leads to sleep deprivation and sub-optimal performance. Plan ahead! Look at your schedule a week in advance to better manage your time and balance out your practice/games, school work, and social activities. Mental focus is directly related to fatigue levels. Becoming “mentally fit” is as important in basketball as staying physically fit. Your mental fitness grows with practice, training and experience. Maintenance starts with adequate rest, proper nutrition, and time management throughout the day keeps the mind sharp. Distractions are everywhere. Especially for athletes. When game time arrives, a great athlete knows how to shut out everything and focus. That additional level of focus is the edge he or she needs to achieve victory over an opponent whose mind is decidedly less disciplined.